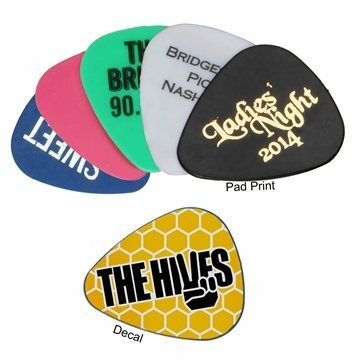 Pick out a promotional product that will resonate with your musically inclined clientele with this guitar pick. Available in several colors, this 1" x 1 1/8" plastic product is perfect for rhythm guitar players of all experience levels. It is a great giveaway for concerts, festivals, shows, parties and more, and it can be customized to your liking - include an imprint of your company name and logo to increase brand recognition on a product that will strike a chord with your customers. loved the imprint and quality of material; loved the price. The merchandise arrived on the scene great, much better than I was expecting. Nice quality for that cost. It had been super easy to buy from Anypromo. Liked Most:the material. Nothing we disliked about it. Nice quality and great price. Not cheap looking like others. Very pleased with the ordering, customer service by Alicia and tracking of the shipped product. Excellent customer service! !